We treat varicose veins developed through pregnancy with non-surgical solutions. It is highly common for pregnant women to develop varicose veins during their first trimester of pregnancy. This is due to the elevated hormone levels and an increase in blood volume which in turn causes veins to swell. In addition to these factors the expanding uterus causes increased pressure on the inferior vena cava, which is the large vein located on the right side of the body. When this vein is placed under pressure the veins of the lower leg tend to swell and contribute to the formation of varicose veins. That said, with each successive pregnancy abnormal veins may get worse and not reduce in size post-delivery. Other factors that can contribute to abnormal veins during pregnancy include aging, standing occupations, obesity, lack of activity, venous thrombosis and leg injury. At Vein Doctors Group we offer pregnancy support services to help reduce the development of uncomfortable and unsightly varicose veins. During your pregnancy consultations our doctors will conduct a completely safe ultrasound scan of your legs to determine the location and extent of abnormal veins. 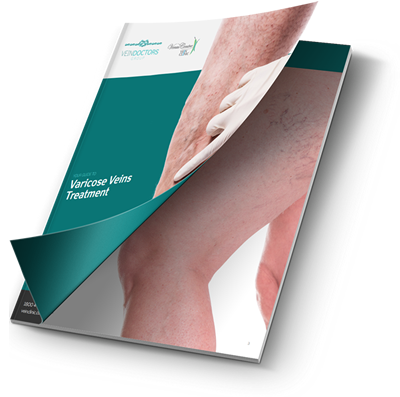 From this information discussions revolve around measures to offer preventative and supportive tools directed at the symptoms and appearance of both varicose and superficial (spider) veins during pregnancy. If you are planning a pregnancy, the Australasian College of Phlebology suggests that abnormal veins be treated beforehand to reduce complications such as clotting, inflammation and severe progression of disease when you fall pregnant. It is generally not recommended to commence vein treatment during pregnancy, but preventative measures can be taken such as the use of special maternity support stockings that are available for purchase at our vein clinics. These stockings can also reduce the aching legs that are predominant during the last trimester of pregnancy. To discover more about our pregnancy support services, or to arrange an appointment please contact us.